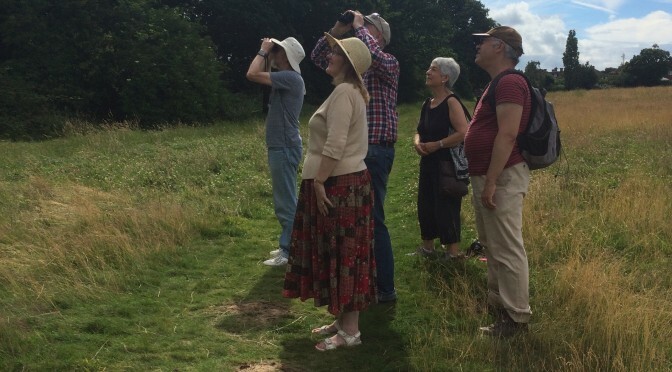 Local enthusiastic amateur, John Denton, will lead us on a walk through the park – introducing you to local flora and fauna, you’ll learn more than you ever dreamt of about the trees in the park, how they’ve survived and thrived, how old they are and much more! Meeting point : Notice Board by the car park. Binoculars and magnifying glass would be handy. Sturdy footwear would be an advantage. Read and download John’s Trees Key and Tree Notes in advance of the walk! We met at the car park in perfect weather for Butterflies, sunny, warm but with some cloud. 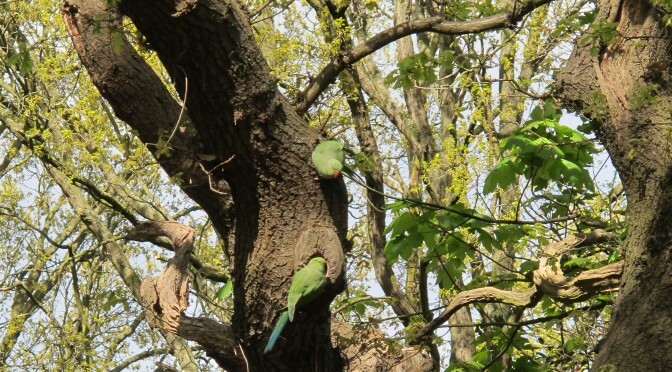 John Denton led us on a fascinating tour of Shrewsbury Park, pointing out the best habitat for different species. In the brambles and hedgerows we saw Large Whites, Small Whites, Green-veined whites, Large Skippers, Small Skippers and an Essex Skipper (not that common) lots of Ringlets and some Comma’s, one of which was very obliging and allowed John to get some really good photographs. We were also fortunate enough to see a Red Admiral and a Holly Blue! In the meadow, there were lots of Meadow Brown butterflies, often in pairs flying in and out of the tall grass. John had brought with him a folder of his own excellent photographs, many taken in his garden, which gave us the opportunity to look at the butterflies we were seeing up close, which made identification easier for us amateurs. One or two species eluded us, but that will make me, for one, more vigilant. 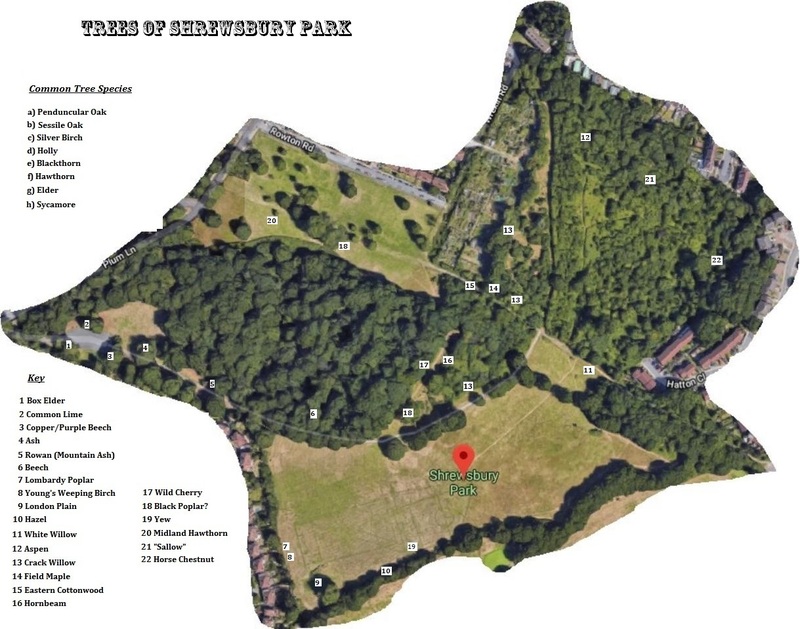 I would like to thank John on behalf of the Friends of Shrewsbury Park for giving up his time and for passing on some of his vast knowledge which, I’m sure, will make our walks much more interesting. How high is that tree? John Denton began with the basics of what we would find, how we could identify or compare species and how the Park tree population continues to evolve. He led us from elder to strawberry tree to ash to horse chestnut, explaining leaf shapes and hybridisation. Clutching different leaves for use later we also learned about judging a tree’s age; the first big oak at the top of the Green Chain walk is about 128 years old, determined after measuring it two ways – girth and height. John pointed out bark as a means of identification and how to tell a crack willow by promptly disappearing into the undergrowth and snapping a twig which gave an obvious ‘CRACK’. 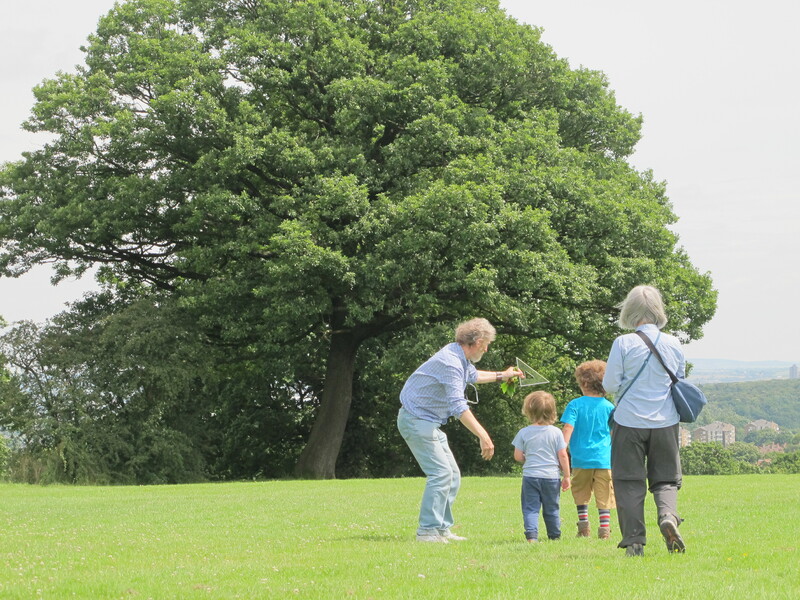 At the end of our wander we were shown the mystery tree, one of two giants in the Rowton Road open area. This is very probably a native British black poplar, it’s neighbour is a male hybrid poplar – and John’s open air story all came together. As Iris said about the butterfly walk, it will encourage everyone to be more vigilant on their walks. Thanks to John’s and Jane’s research and preparation, the two hour excursion was very rewarding. 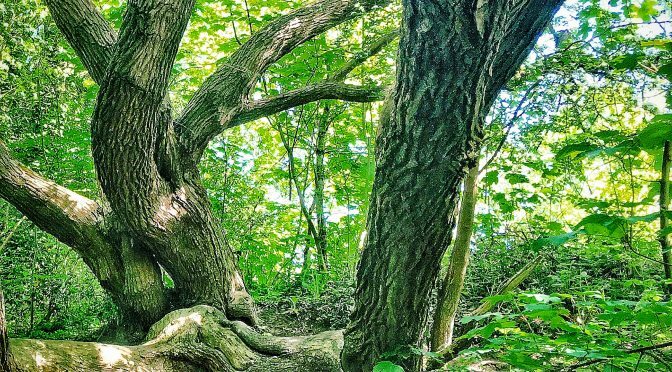 If you have a favourite tree, why not watch it over the seasons or take a picture for next year’s photo competition. 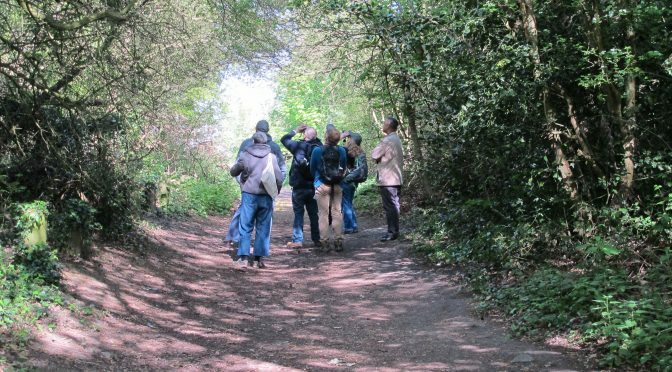 Join John Denton, a woods-wise FSP member, as he leads us on an hour’s walk through the Park; identifying trees by leaf/fruit/bark, finding the height of trees, calculating their ages, making bark and leaf rubbings AND tree beating! Correct meeting place is by the notice board in Plum Lane carpark . Wear sturdy shoes. Route will be off and on the paths, so please contact fspdog@hotmail.com to help us accommodate mobility issues.